12 Days Of Holiday Music: Day 7 - "Carol of the Bells"
Holy mackerel, the Nor'easters have raised the bar once again, and this time they accomplished it with not a single soloist in sight. If we've learned anything from groups like the Nor'easters over the years, it's that there's always room for "more." By more we mean more imaginative arranging, more ways to use lighting, more theatrics, more dynamics...just more. And when you think you've ran out of ideas, keep experimenting till something sticks. 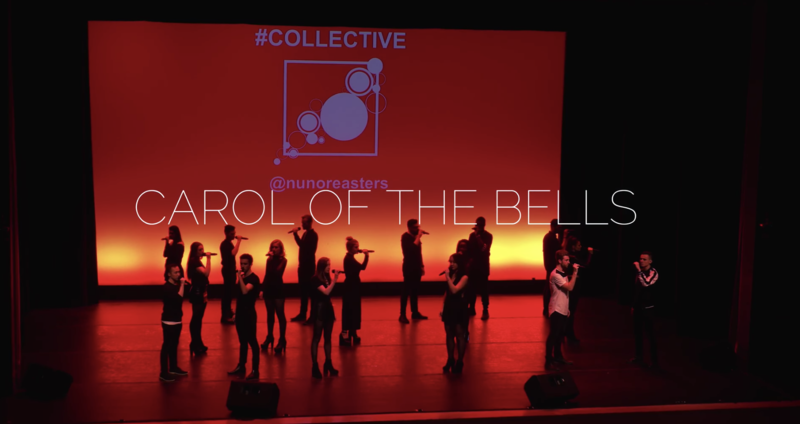 Well, in our next addition to "12 Days of Holiday Music" the coed a cappella group from Northeastern University brings so much more to the popular Christmas song "Carol of the Bells." From the opening, you'd guess that the group is gearing up for one incredible rock performance by the precision of the syncopations and the higher vocals. But you'd be dead wrong. In fact, it's all one massive build to a modern day, in-your-face retelling of one the most popular holiday tunes of all time. What follows is a performance that features a variety of musical styles from Gregorian Chant to contemporary rock, monumental, blow the roof off dynamics, and one of the best displays of spacing heard in collegiate a cappella. And this is just what you get from a technical standpoint. Simply sitting back and appreciating the music with no other ulterior motive other than the sake of enjoying music will satisfy the senses in a truly special way. This is what the holidays are all about, joy. And we're filled with an immense amount after watching this new video by the Nor'easters.